The Hotel Palazzo Del Corso is an elegant five star Luxury Hotel placed on Corso Roma, the main street ofGallipoli, just a few steps far from the Old Town and very near to the main attractions of the Salento peninsula. It’s the ideal place where the guest can enjoy the wellness of a holiday to the seaside but near to places of Historical and Cultural interest, such as Lecce, Otranto and Santa Maria di Leuca. The finest furnishings, the love for attention to detail and the comfort are all that you can find in the rooms and suites. Three room types, each room is unique and different from the others. Those rooms are the best you can find in the Hotel Palazzo Del Corso.The grand Suites are the most requested rooms and are on two levels. Thanks to its elegant furnishings, the beautiful carpets and the parquet floor they offer a precious décor and an absolute elegance. On the ground level one can enjoy big leather sofas, a TV color LCD, minibar and a balcony with delightful sea view and view of the main street of the city. On the first level there is a pleasant bedroom and a marble bathroom with shower. Each Grand Suite has got its own stunning fresco original of 1800. Pleasant and comfortable double rooms with elegant canopy beds and “Carparo”and “Pietra Leccese” ceilings and arches. The rooms are fitted out to cater for every need and sleep up to three people with an extra bed. Double Rooms or Twin Rooms, user friendly in order to satisfy needs and expectations of the travellers. These rooms are frequently used as Double for single use. In Gallipoli, the Hotel Palazzo Del Corso has become the favourite place for travellers, who love to be pampered and feel the sensation of being at home, even if they are miles away. 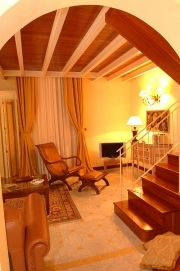 One the best Hotels of the Lecce province and of Apulia, The Hotel is synonymous of elegance and intimacy and pleasure. 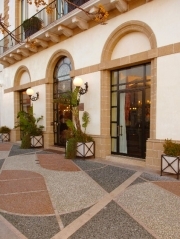 The Hotel Palazzo Del Corso is placed on the main street of Gallipoli. Shopping is right next door. From June up to September the hotel collaborate with the best Private Beaches of Gallipoli, where you can spend your time in a relaxing and comfortable way. The Hotel Palazzo Del Corso can provide transfers from and to the Airport, to Lecce Train Station and to the Beaches (Services on previous request/additional fee).